Friday the 13th is a day and a phrase that draws lots of us to have images going through our heads. I’m not sure what pictures come to your mind, but I have a one that is in black and white that comes to mind for me. It is based on the photo here. Yes, my parents got married on Friday the 13th. You may think that’s an omen and people certainly did not welcome that date all those decades ago… but my folks could sense a bit of luck in the air. They knew they were forging their own path. That’s something else. So when florists or others asked whether they were seriously getting married on Friday 13th, my parents assured them they knew that the 13th was indeed on a Friday. In the years that followed, my parents built a family that included four kids who went on to build successful lives as well. And even though my dad died years ago, before some of his grandkids were born, I have to say he comes to mind on Friday the 13th and for Father’s Day so this weekend he is doubly on my mind. My family is scattered across several states and cities but I know that my mom, brother, sisters and I will all take time to notice the day in our own way, and it seems to strike me anytime we have a Friday the 13th anytime of year. 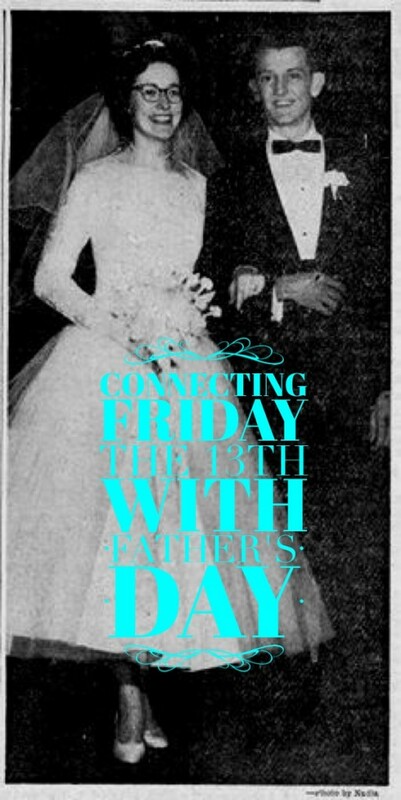 Not sure whether my parents thought about the fact that by getting married on Friday the 13th, they created a very different visual for generations to come, but that’s sort of what they did. And by sharing it here, maybe some of you can have a much more pleasant picture than Jason from the movies. Oh, and in case you’ve been reading about how incredibly rare the full moon on Friday the 13th is… you may want to read Slate’s “A Spooky Friday the 13th Full Moon … Or Is It?” It’s not as spooky as some would lead you to believe!